Contact Newman’s wholesale by calling 503.286.5950 in order to obtain a username and password. Once you have done so, login and view the Daily Fish Report and place wholesale orders online. The History of Newman’s Fish Company dates back more than a century to 1890 in Lane County, when founder John Henry Newman was just 13 years old. John first peddled fish using a horse-drawn cart on the dirt roads of Eugene and Springfield. Newman’s Fish Company soon became a family affair that included his brothers, wife and two sons with both retail and wholesale locations in Lane County. The family was a fixture in the area and shared their knowledge of seafood and commitment to quality, selection and service with their customers and community for more than 70 years. In 1963, the Newman brothers sold Newman’s Fish to Ben R. Bay, a commercial fisherman from Astoria. Ben Bay continued to expand the business and held true to the family tradition of quality, selection and service. The Columbia River, Astoria and Newport were Ben’s primary supply sources. Ben would make early morning “fish runs” to buy fish filling his pickup with thousands of pounds of fresh smelt, salmon and filleted bottom fish. In 1979, he sold the business to Dwight Collins and Leonard Odegard, two former employees with experience in the business. With the increased ease in airfreight, they were able to go beyond selling seafood from the Pacific Northwest. Soon Newman’s was able to add warm water fish such as tuna and swordfish as well as seafood selections from Massachusetts, Maine, Alaska, Hawaii, Chile, Mexico and New Zealand to the list of seafood available for customers. Fish Wholesale Locations in Portland. By 1986, Newman’s was ready to expand North and entered the larger Portland market as Newman’s Fish Markets, Inc. with John Cleary as managing partner. With a large customer base, the combined Eugene and Portland operations had greater buying power. This economy of scale made it more affordable to buy and transport seafood and maintain Newman’s high standards for freshness and quality. In Portland, Newman’s Fish Market began in the retail business. The first Portland retail location was inside Holladay’s Market. Three years later, Newman’s Fish Market opened inside City Market on Northwest 21st. Over the years, the company also had several other retail locations where Portlanders could go to find the finest and freshest fish in the city. However, as the retail landscape changed and the wholesale business took off, the company made the decision to focus more of its resources on the wholesale side of the business and consolidated retail operations at City Market. 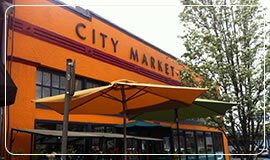 Today, City Market remains the place for retail customers to go for premium quality seafood in Portland. At City Market customers can find knowledgeable, helpful staff and a huge seafood selection in its glass cases and fresh tanks. Newman’s started selling top quality seafood to fine restaurants in the Portland metro area in 2000. From the beginning local restaurants and chefs appreciated the quality, selection and service Newman’s offered. The fish wholesale business continued to expand as Portland grew as a “foodie city” with more and more local restaurants emphasizing high quality and the freshest ingredients. Today Newman’s is proud to include the finest restaurants in the Portland Metro area as customers. In fact, you can find many of our customers featured in the Oregonian 2012 Diner, which lists the top reviewed restaurants in the city. Newman’s takes care of the fish along the way— from the boat, to transport and storage, to finally hand cutting the fish to order each day. And Newman's takes care of customers. Whether it’s handling emergency orders, going in on fish buys together, or making menu recommendations—the Newman’s team is ready to go the extra mile for you.